ShammingSituation: BOOK REVIEW- You never know : sometimes love can drag you through hell by AKASH VERMA. 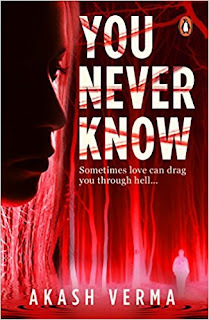 BOOK REVIEW- You never know : sometimes love can drag you through hell by AKASH VERMA. REVIEW : when you come across such good romantic-thriller book, you just build up a lot of expectations, coming that from an author like Akash Verma you just can't delay in reading his book. i have read his previous two books and his storytelling skills is just amazing. coming back on this book, the blurb gives u a crux about what the story is going to be. since the time i picked the book up i just stepped into the shoes of each and every character when they narrated their parts. The story is gripping enough and you shall not be able to leave the book till the time you finish it off. till the very end it becomes really tough for the reader to predict the ending, the ones liners used in between the story are exceptionally good. The editing is just mere perfect, i couldn't find one single mistake in the entire story. Hardly you come across such books which are just perfect in their literal sense, from cover to blurb to the story writing and infact the editing, for me this book just stood on my expectations on all the grounds. pick this book up and enjoy over a cup of coffee.